Researchers from the University of Oviedo have for the first time analysed a DNA fragment from commercial feed for aquarium cichlids, aquaculture salmon and marine fish in aquariums. The results show that in order to manufacture this feed, eight species of high trophic level fish have been used, some of them coming directly from extractive fisheries. Aquaculture initially came as an ecological initiative to reduce pressure from fishing and to cover human food needs. However, a problem has emerged: consumers prefer carnivore species, like salmon and cod that require tons of high quality protein for their quick, optimum development. "If these proteins are obtained from extractive fisheries, aquaculture stops being an alternative to over-fishing and starts contributing to it, turning it into a risk for natural marine ecosystems" Alba Ardura, lead author of the study published in 'Fisheries Research' and researcher in the department of Functional Biology at the University of Oviedo told SINC. The research team analysed a DNA fragment from commercial feed made for aquarium cichlids, aquaculture of salmon and marine fish in aquariums. After removing oil and fat from the feed, DNA sequences were obtained and compared with public databases to identify the species found. From fish feed samples, supplied by manufacturers and bought in animal shops, researchers identified eight species of wild marine fish that were from high trophic levels in the food chain. Industrial waste from processing and commercialisation for human consumption of Peruvian anchoveta (Engraulis ringens), European sprat (Sprattus sprattus), Pacific cod (Gadus macrocephalus), whiting (Merlangius merlangus), Atlantic herring (Clupea harengus), Pacific sandlance (Ammodytes personatus), jack mackerel (Trachurus symmetricus), and blue mackerel (Scomber australasicus), allow fish meal for aquaculture fish to be made. Nonetheless, according to the researcher "some of the species found in this feed are commercialised fresh without being processed and they suspect that they came to the feed directly from extractive fisheries." This is the case with herring and Pacific sandlance. The research suggests that aquaculture is partly maintained by fisheries, and aquaculture fishes are fed by wild fish sold "whole" (without being processed) and fresh directly from fishing vessels. "If species from extractive fishing are used to feed farm fish, aquaculture does not help minimise over-fishing" warns the expert who suggests "urgently" revising the composition of aquaculture feed to replace them with other proteins. The aim is to reduce the exploitation of natural fish populations. Ardura proposes increasing efforts to gain high quality proteins from other sources, such as vegetable proteins, which supplement farmed fish's nutritional needs. This way they will be able to "minimise the impact of aquaculture on wild populations." More information: Ardura, A.; Horreo, J. L.; Hernández, E.; Jardon, A.; Pola, I. G.; Martínez, J. L.; García-Vázquez, E. "Forensic DNA analysis reveals use of high trophic level marine fish in commercial aquaculture fish meals" Fisheries Research 115: 115-120 DOI: 10.1016/j.fishres.2011.08.011 March 2012. It is nothing less than criminal, the irressponsible industrial farming practices going on with the current state of the oceans fisheries. 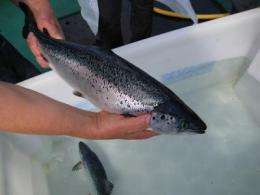 However, there is considerable suffering to carnivorous fish such as salmon made to eat vegetable feed. While lower in contamanints,vegetable oil based feed causes Atlantic salmon to have pretty wretched stomach tumors from being in a constant state of inflammation: "This is the first report on feed-induced intestinal carcinogenesis and metastasizing adenocarcinomas in fish fed an approved commercial diet. The pathogenesis was associated with a certain commercial diet provoking the inflammation-dysplasia-carcinoma sequence. The histologic progression was analogous to that of human colorectal cancer associated with inflammatory bowel disease." Cancer Res. 2009 May 15;69(10):4355-62. Epub 2009 May 5.